If the hallway scene rekindled your Darth Vader love affair, you’ll be glad to know all four volumes of his new comic series are on sale on Kindle today. The first three volumes will only set you back $5 each, while the fourth is marked down to $10. Once you purchase, you’ll be able to read them on basically any device via Comixology. 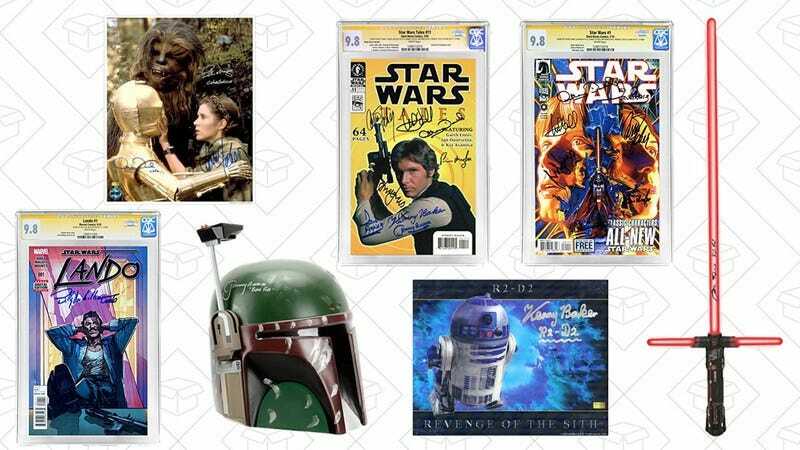 Never tell me the odds that Amazon would host an incredible sale on signed Star Wars memorabilia to celebrate May The Fourth. Everything from a Kenny Baker/R2-D2 photo all the way up to a Dark Horse Comics and glossy photos signed by all the big names are there. These prices will set like the two suns of Tatooine at the end of the day, so it’s do or do not, there is no try. Star Wars Battlefront isn’t a perfect game, but it’s a decent way for Star Wars fans to kill time until The Last Jedi comes out, and you can get the Ultimate Edition (complete with season pass) for just $20 today on PS4, Xbox One, and as a digital Xbox One download. If you’ve caught drone fever but don’t have hundreds of dollars to spend on a DJI Phantom, Amazon will sell you a basic camera-equipped quadcopter today for just $38. It should go without saying that this isn’t a professional tool by any means. The camera only shoots 720p, and the results look like something that might have come out of a 2009-era smartphone (here’s a sample video). But hey, it’s a camera in the sky for under $40! Wedge pillows are great for preventing the neck pain that can come with reading or working in bed, and Prime members can own one for $18, an all-time low. Never has a house been built with a sufficient number of power outlets, but that’s easy to remedy with this two-pack of AmazonBasics power strips for $9. You probably know by now that Anker’s PowerCore line is a popular brand of USB battery packs, and the 20,000mAh model is marked down to just $34 today, or about $6 less than usual. For reference, that’s enough juice to charge an iPhone 7 about seven times, or a Galaxy S8 about four times, making it perfect for sharing during long flights, camping trips, or conferences.